Molluscum contagiosum (MC) is among the most common viral skin infections seen in children. 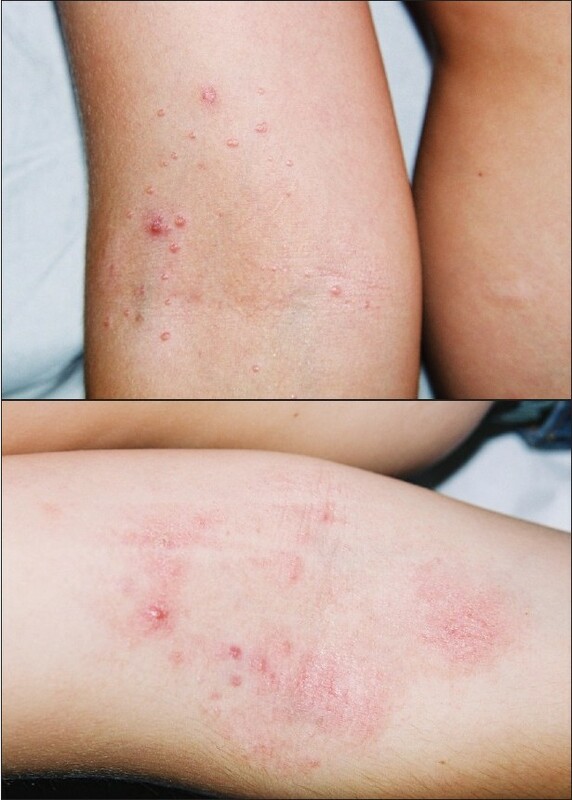 Although the lesions may resolve spontaneously over a period of a few months or years, there are several reasons to treat them: i) the lesions can be cosmetically unappealing, ii) patients may develop a pruritic eczematous eruption, and iii) the lesions can be numerous and recurrent, especially in patients with atopic dermatitis. No therapy is universally effective. We report herein six cases of children having MC who were treated with a zinc oxide cream containing colloidal oatmeal extracts (Avena rhealba) with dramatic results. Six healthy children with ≥ 10 cutaneous lesions of MC were treated in this open study. No other therapeutic procedures were undertaken with this treatment. Parents were instructed to apply the cream once daily at bed time to all the lesions for four weeks and the patients were evaluated at baseline and after four weeks. MC is caused by MC virus, a DNA virus of the poxvirus family that replicates only in human epidermal keratinocytes. A variety of therapies exist for the treatment of MC, and all have their own drawbacks, thus warranting the need for a non-destructive, self-administered topical therapy that is both safe and efficacious. Taking this into consideration, we have undertaken an open trial with a zinc oxide cream containing colloidal oatmeal extracts. Colloidal oatmeal is present in a variety of dermatological and antiirritant products and has antiinflammatory properties. Recently, a study demonstrated inhibitory effects of oat extract on eicosanoid formation, expression of cytosolic phospholipase A2 (PLA2), and arachidonic acid mobilization in human keratinocytes. We hypothesize that these antiinflammatory properties may play a role in the dramatic antiviral response observed in the six children in this study. Indeed, PLA2 activity was found to be critical for infectivity of some viruses such as parvoviruses. In addition, studies suggested that poxviruses have an obligate requirement for arachidonic acid metabolites during replication and possess multiple genes that regulate arachidonate metabolism. Obviously, randomized controlled studies are needed to confirm the effectiveness of this treatment, but its excellent safety profile appears to offer an attractive therapeutic option. 1. Gottlieb SL, Myskowsky PL. Molluscum contagiosum. Int J Dermatol 1994;33:453-61. 2. Aries MF, Vaissiere C, Pinelli E, Pipy B, Chaveron M. Avena Rhealba inhibits A23187-Stimulated arachidonic acid mobilization, eicosanoid release, and cPLA2 expression in human keratinocytes: potential in cutaneous inflammatory disorders. Biol Pharm Bull 2005;28:601-6. 3. Zadori Z, Szelei J, Lacoste MC, Li Y, Gariepy S, Raymond P et al. A viral phospholipase A2 is required for parvovirus infectivity. Dev Cell 2001;1:291-302. Pazyar, N., Yaghoobi, R., Kazerouni, A., Feily, A.